My colleague, Jon Evans, asks students in his Plant Systematics and Evolution class to produce a holiday wreath at the end of the semester. 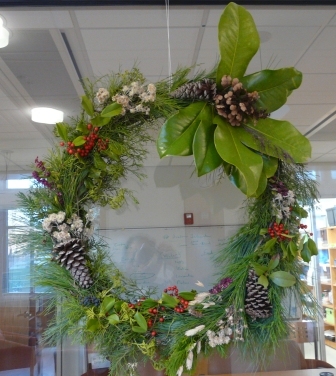 Their challenge: to build an attractive wreath using as many plant species as possible. Sewanee’s 13,000 acres have no shortage of plants to select from, over one thousand species at last count (of course, no rare species find their way into the wreaths). 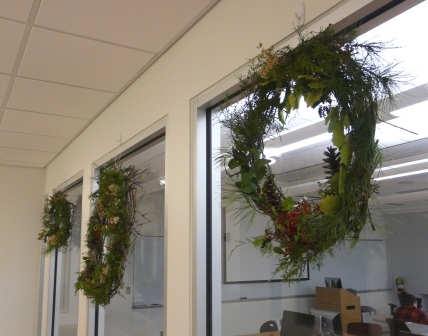 The wreaths are hung on the walls in Spencer Hall, giving us all a nice boost as we work on final exams. Luckily, the Microbiology class has chosen not to mount their ripe petri dishes on the adjoining walls. This entry was posted in Berries, Moss, Plants on December 13, 2011 by David George Haskell. that’s a great assignment! love it!